Custom printed bags come in a huge array of colours, styles and sizes. Often-times the bags will be custom made for a either a specific event, or to cater to a very special promotion or launch. If you are participating in a trade fair, exhibition, roadshow or store launch one of the options you can consider is creating a bag with the event logo or slogan printed. Other times that you might need a custom printed bag include for a goody bag, door gift or sign-up gift for an event, show or seminar you are holding. After all – if you are giving away a goody bag, don’t you want people to be seen carrying it around? 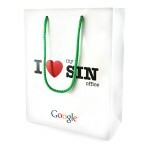 The “I love Sin” bag was created by google to hold their premiums and gifts for a series of seminars that they were arranging. Items that can be contained within bags like these could include custom printed mugs, customised t-shirts or even your own branded power bank that you are giving as a corporate gift.